The only downside to having a gluten free pizza place in your city is if said gluten free pizza place is the only one in said city. So whilst I still enjoy the delights of Simela, my pizza based life was certainly lacking a little originality. Thankfully there are other people in the world who understand this problem and one of them decided to start offering gluten-less pizzas here in Berlin, happiness and joy! Cielo di Berlino itself is a kind of a little place, situated in what appears to be an old Berliner Kneipe (a pub of sorts, usually situated on a corner) a little south of Yorkstrasse. Their bases are made from buckwheat and yes, you did read that correctly, they also offer lactose free cheese on the pizza! The interior is in keeping with the history of the place, you have a few small wooden tables with flowers and such on them and the clientele is varied. On the night I visited there was a nice mix of young couples, the odd tourist and an old couple who seemed to of been coming to the place for the last 40 years. The menu itself is nice and simple and fairly standard, pick your pizza type and then add on two euros for the glutenfrei version (note, it’s only available in small). Then, you should expect to wait a while. This isn’t a big restaurant with a giant kitchen staff, neither is it an exercise in stale pre-prepared goods, rather each pizza is made fresh by hand by (on my visit) a single guy behind the counter. This is a definitely a good thing, but if the place is busy, you will need to be patient. So, when the pizza arrived, I was rather hungry and excited. Now, the only downside to this whole experience is that I was not blown away by the pizza itself, the toppings were only ok and the whole thing was a little over seasoned, but not enough to be a problem. The base, however, was rather good, thin and crispy and definitely better than the base at Simela. As the gluten free pizza is only available in small, I was quite happy to see on their menu that they had some desserts available! Plus, only €1.70! I quickly ordered one. It was rather delicious and rich, the perfect gluten free dessert. In conclusion, I would recommend Cielo di Berlino, whilst the pizza is not as quite good as those at Simela, you have to remember that it is also half the price and that they offer gluten free desserts (plus, the odd other dish which is gluten free). Add to this that the place has a little more character and soul to it and it makes up for it. A friend recently introduced me to bofrost, an online frozen food delivery service, as they have a rather good free-from section. Thankfully they offer mostly gluten free versions of regular frozen foods rather than just foods that happen to not contain gluten, something rare and rather good. I find I often just want to eat the same junk food/breaded meat products that I ate before the whole gluten problem arose. So off I went and ordered a freezer full of gluten-less treats. Up for review first, the pizza. Now, the pizza on the box looks quite good and tasty. Lets open it up and see what we get inside! Hmm, I guess it’s similar. But, this is one thing that I don’t get with the glutenfrei frozen pizzas I have bought thus far, they all tend to be on the bottom end of the scale. In the gluten world you can buy cheap nasty frozen pizzas and high quality frozen pizzas, so why are the gluten free ones so cheap looking and lacking in flavour? But, i rescued it by adding my own toppings, so the only important factor is how good was the crust? Well, allright, a little hard and cardboard like, but then it is gluten free. In conclusion, at €5.95 a pop, i don’t think it’s worth it. I would not recommend visiting Simela anymore as their standards have dropped significantly. I ate a pizza there recently and had a fairly severe gluten reaction, most likely due to significant cross contamination. In addition to this their service is below standard with long waiting times for food. Update Summer 2014 – They are now working to improve their service and reduce cross contamination, although I’ve not been back to verify for myself. I was in New York late last year and what struck me most about the place was the abundance of restaurants and bakeries that didn’t just know about glutenfrei-ness, but that they actually made gluten-less items. The ones I looked forward to the most were the pizzerias. As in, actual pizzas, made by someone else (ie. actually good and containing flavour, I’m somewhat inept at the making of pizzas myself), cooked properly and all gloriously absent of gluten. 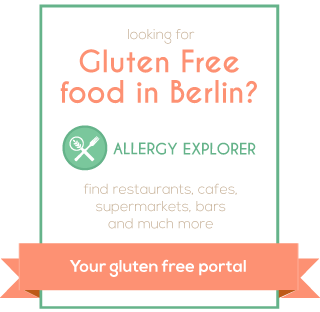 So, when I heard that we have an actual pizzeria in Berlin that can do gluten free, I almost popped. The place itself is pretty small, there are only 3 tables/high benches on the left, each seating four people and then a few spots against the wall on the right. Basically, if you want to sit down and eat, its best to reserve a place. The menu is all above the little serving booth, written in chalk. Probably the first time I’ve actually seen a glutenfrei written on a menu like this and not just as a side option scribbled below the description of a regular meal. They are a little more pricey (an extra €4 above the wheat based one) but, as you can see from the lack of pre-defined pizzas, its a very much think of what you want on your pizza and they make it. The staff themselves are very friendly and very happy to suggest good ideas for pizza toppings before disappearing away to create a little magic in the back. The pizza itself was rather delicious and in my opinion far above what I had in New York, it just had a little more flavour to it and I preferred the base being lighter and crispier. In conclusion, yes, its pricey. But its good. Go (but reserve/let them know you’re coming and wanting of gluten-less pizza).